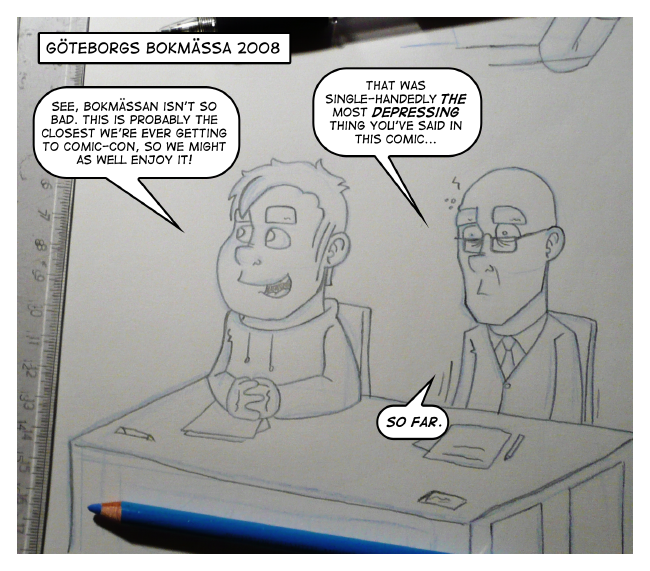 Even though I liked to think that Göteborgs bokmässa was kinda “my Comic-con”… well, it’s just not even close to Comic-con. Not saying it wasn’t fun attending it yesterday though, it was great. I just wish it was more about comics and less about books. But then again, it’s a bokmässa (book fair). So that’s why instead of doing a strip for today, you get this piece of crap… uhm, I mean “sketch”. A nice sketch. This entry was posted on Friday, September 26th, 2008 at 1:16 pm and is filed under Comic. You can follow any responses to this entry through the RSS 2.0 feed. Both comments and pings are currently closed. Aah. Var du på bokmässan? Varför gick jag inte dit?! D: Tusan.